Recently, I posted an Instagram story of a cabinet in our kitchen. 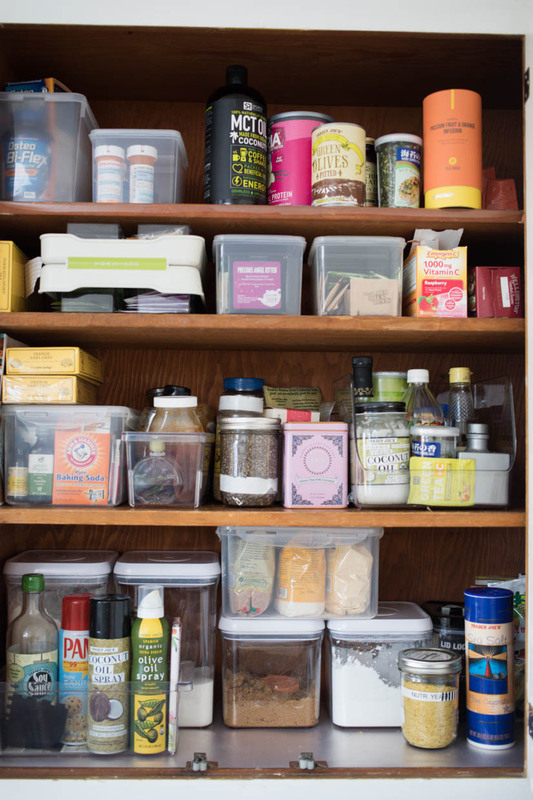 I got a lot of questions about it so I thought I'd do a post on how I organize our kitchen, specifically food, with limited space. Our kitchen is pretty small so we have to be thoughtful about what we have and how we organize. It's been a work in progress and has taken time to feel like we're actually being smart about how we're utilizing the space, though I'm never 100% satisfied. Since working from home and cooking more, I realized there were a lot of things I could do or change that would make getting meals together faster. The two biggest problems we faced were space and organization so I took my time to find things that worked for our space. Keep reading for some tips and tricks on how we make our small space work and please comment below if you have any advice to offer! You can also find my favorite kitchen organization products on my Amazon Wishlist. We have very limited counter space so we keep out only the essentials (plus my pretty stand mixer). Olive oil, salt, pepper, knives and most used utensils sit around a wood cutting board so everything is ready to go when needed. Our favorite snacks of the moment get put into large jars with airtight lids that stay on the counter so they're easy to get to. This also helps with keeping chips and crackers from getting stale from sitting too long in their open bags. I love these Le Parfait French Glass Preserving Jars because of the wide mouth and hinged lids. One of our cabinets has to serve as our pantry since we don't have one in the kitchen. Putting things in their own containers has helped tremendously with making things easier to grab. We also have to stack things up so there's a place for every bottle, package and container meaning nothing is hidden in the back or corner that we can forget about. 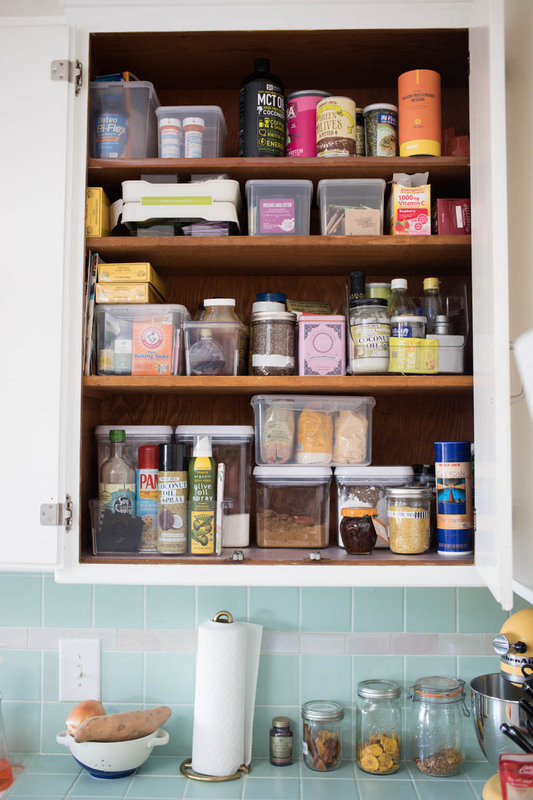 Transfer things like flour and sugar to their own designated containers to keep the space for them consistent, avoid spilling and to keep any pests out. I love the Oxo Airtight Storage Containers because they come in a set of different sizes. One of my other favorite kitchen storage tools is this tea caddy. Organize like-products together, like honey, maple syrup, and agave nectar in one container and baking soda, baking powder, and vanilla extract in another. This way you can just grab the entire container as needed. You can also find great food storage containers at Daiso and HomeGoods. I found this 3-tiered basket at Home Goods and put it up next to the fridge to hold foods like rice, pasta, and easy-to-grab snacks. Get creative and utilize oddly-sized open wall space by putting up baskets or shelves for storing dry goods, fruit or anything that can withstand being out in the open. We have an odd shallow cabinet above the kitchen sink so I put our pretty coffee mugs, juice glasses and spices in it. I was tempted to remove the doors completely but Chris was opposed. Still, I try to keep this cabinet organized in a way that when the doors are open, it still looks pretty. I transferred spices into small glass jars, again so the look and space stay consistent. Another handy tool I love is my label maker which I use to label anything I put in its own containers. All in all, I'm pretty content with how our cabinet space and kitchen is organized at the moment but of course it's bound to keep changing based on what we're using and cooking with. Not pictured are the other two cabinets that house the rest of our dishes and pots and pans but more on that another time. The most important thing is to build and organize according to what works for you. Be thoughtful from the very beginning about what you need, keep and buy. I also highly recommend the book Remodelista: The Organized Home by Julie Carlson for some great inspiration on organized and minimalist living. Happy organizing and thanks for reading!